Thanks to all of our customers for making 2006 a great year. To celebrate we threw a little party. When you walk into a bar and they have created an orange cocktail for your Christmas party, what on earth would you think? As you can see from the photograph our company logo contains a fair amount of orange so, perhaps, it’s not surprising but it was an interesting twist and an excellent introduction to a superb evening. We throw a customer party each year to say thanks them and also because it’s great to see them. I think they also appreciate the fact that they get to meet people in the industry – sometimes, competitors – that they wouldn’t otherwise talk to. I introduced two London based radio stations to each other. They’re less than ten minutes walk from each other’s offices yet these on-line guys had never met. As it’s that time of year, I’d like to say thanks to all our customers for making 2006 a memorable year for us. Thanks to those of you who travelled from overseas to be with us. Have a great Christmas and we look forward to working with you in 2007. Travelling again. And, once again I am heading for Oslo. I am off travelling again. This morning it was a very early start to get me to Heathrow so that i could make a flight to Oslo. To give myself some extra time because of the sceurity I arrived at 5am – only to find that check-in wasn’t open until 5.20am. Then a nice queue at security and a plane ride to get me here. I am now too exhausted to enjoy the lovely evening. Still, I hope I can get a decen’t night’s sleep so that I will be awake for tomorrow’s meetings! I wonder what would happen if Jeremy Clarkson were to become Mayor of London. Yesterday, I spoke about my liking of the BBC’s Top Gear programme. It’s odd because I would not have pegged myself as the kind of person who would watch it. 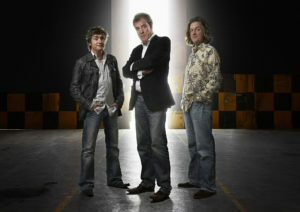 Regardless, I find the three presenters funny, infuriating and very watchable. Now, I wonder what would happen if Jeremy Clarkson were to become Mayor of London. It is rumoured, you see, that his name has been suggested as a prospective Conservative candidate. Give that the current Mayor blamed Jeremy for global warming and the possible destruction of life on earth, [The Times Online] I think it would make an interesting election indeed. Now I have a lot of time for Ken Livingstone but I can help thinking that I would like to see him as the ‘star in a reasonably priced car’. Especially as he, apparently, has no licence and can’t drive. Author jonPosted on August 3, 2006 August 4, 2017 Categories Miscellany 2006Tags televisionLeave a comment on What’s The 20th Most Complained About Show On UK TV? Where Are My Palm Treo 650 SMS Messages? What happens when the SMS database on your Treo 650 stops working? You may be aware that I have been a long-time Palm user and fan of their products. Sure, like many, I have been frustrated that their development lacks the pace of some of the others in the same space and their product range is limited. But, I was a user of the Treo 600 when it was first launched in the UK and am, currently, a Treo 650 owner. They may not be the best ‘phones in the world and they’re old-school when it comes to PDA functionality these days but they more-or-less work for me. I also have a Palm Lifedrive that I don’t really use and am trying to find a sensible use for. Having said that I am a fan I really must impress upon the product managers to work with users. It’s always the technology that lets me down. Yesterday, just before I went to Helsinki, my Treo’s SMS Message program somehow corrupted leaving me with limited access to messages. There are a few users who have posted handy hints but little official help (its the Messages Database in case you’re wondering and not the SMS Messages as some threads seem to hint). I spent a good hour trying to fix it as SMS capabilities are quite important to me when I travel (it saves on the cost of the calls). To resolve the problem I had to completely remove the Messages Database and then we were back to normal functionality. On my journey of Palm discovery, I realised there is really no SMS back-up help. I sync my Palm daily and you would have thought that SMS and MMS messages would have been archived in the Palm Desktop. But no, they are stuck in their little databases with almost no way to get them out – and once your database is corrupted all hope is gone. Fortunately for me, it’s not that important to keep old messages but it’s nice. This site is a reminder of things I did and I increasingly use my Palm Treo 650 photographs on Flickr as a visual reminder of what I have done. It would be nice to add a SMS/MMS timeline to that as a personal record (a little like Nokia’s Lifeblog). So, c’mon Palm: help us keep our data in multiple ways. Author jonPosted on August 1, 2006 Categories Miscellany 2006Tags pda, phone, technology, TreoLeave a comment on Where Are My Palm Treo 650 SMS Messages? I believe we have a lot of research to do to find the true value of inferring things from on-line behaviours. Inferences are either too simple or require a vast amount of data and analysis (which is expensive). It’s Easter Monday (for my US friends, that’s a public holiday in here in the UK). What did you do this Easter? I’ve been visiting family, and eating Easter eggs, in Shropshire and Wigan. I’ve been observing Roman ruins in Wroxeter (or ‘Viroconium’ as it was known when it was the fourth largest city in Roman Britain). I watched the film, Walk The Line, at Shrewsbury’s new(ish) Old Market Hall cinema. A lovely weekend. So, if you were in the advertising business what adverts would you like to show to me now that I have shared this information with you? You know a little about my likes if not a lot about my dislikes. Based on what I’ve just told you, would you promote a new film (Walk The Line was released in February so I am not sure it says I am big on new releases) or a new chocolate bar (I did extend my Cadbury’s love affair) or would you promote something historical? I am not sure there’s a movie based on Roman chocolatiers, but if there is then let me know! Now, I know you’d actually profile me, determine that Walk The Line didn’t literally mean I loved country music but the fact that I bought Easter eggs and spent time with family firmly plants me into a demographic and the result of it all will be an ad for the new Volvo, or something similar. You get the idea. We can leap from A to C via M without much justification, can’t we? This, however, is an issue I am struggling with at the moment at work. I know, I once promised not to write about work here but I’m not dwelling on specifics so go with me. I’ve pretty much spent the last few weeks working with customers on how to implement behavioural targeting concepts for their web sites and if those concepts are right for their advertisers based on the customer’s behaviour patterns on the site. Behavioural targeting isn’t actually as scary as I suspect some people think it is. It just suggests, anonymously, that if you have performed an on-line search looking for a new car then you might be looking for a new car. Now, if you do this on a car web site then it’s pretty much given you’re in the market. It’s not rocket science. Nobody knows who anybody is and I’m only working with technologies that do not share data between marketers. This way my behaviour on one site is not shared anywhere else. I’ve previously worked with technologies that tried to do this on a network level but it didn’t work then as the tech was too slow. DoubleClick moved away from network profiling in 2002 but, of course, technology has moved on and those working in that space should be able to be much more efficient. The digital advertising industry is awash with people talking about behavioural targeting. I believe that reputable organisations will always exceed privacy legislation and protect their customers better than the law demands. After all, it’s in their interest. However, behavioural data requires so much analysis that I have to question if it is right for everybody. Certainly, publishers with a large user base who come back regularly might get some insight that would be useful to advertisers but we, as consumers, are complex beasts. Our likes and dislikes change based on many factors; advertising can help inform and change my mind and really don’t you want to advertise to all people interested in buying a car? Why just those who currently think it should be a new car? But what about my friends network or family? Aren’t they just as influential? We can’t look at their behaviours too but they are important in how I make decisions. Isn’t behavioural targeting too limiting then? I believe it works in the right places. I believe that the technology I am working with is the best of breed for publishers. It’s anonymous and doesn’t enable any kind of network sharing so it’s good for consumers too. But finding the right use cases is the hard part. How do I prove that this technology is working. I think we’ve some investigation to do yet. I know that I am over simplifying arguments to make my point but I believe we have a lot of research to do in this space to find the true value of inferring things from my on-line behaviours. Inferences are either too simple or require a vast amount of data and analysis (which is expensive). I’ve got to spend the next few weeks reading a lot more data on this. If you’ve got anything that would be helpful then you know where I am. Disclaimer: These are my view and not those of my employer. You have done the whole full disclosure thing, haven’t you? The Doctor was back tonight and the new Doctor is just as good as the last. The first episode of this new series, New Earth, was great. Rose, invaded by Casandra, and shouting I’m a Chav was a very unexpected amusing moment: almost as amusing as the Doctor saving the earth with a satsuma in the Christmas episode. Saturday nights are settled until the summer then. UPDATE: You really should go and look at the BBC’s Doctor Who website for the new series – it’s really well done and there are tons of extra features & material online. The staff of the Orange shop in Wimbledon were very helpful. Thank you. My mobile phone developed a fault. It started a few weeks ago but has made the device unusable now. There’s an electrical noise that became so bad other people couldn’t hear me. I could hear then but they had no idea what I was saying. So, I went to talk to the people at Orange and discovered they don’t have the right phone on the insurance that I have been paying for. They said it’s my fault, I said it was their fault. Anyway, after much discussion it appeared that I could upgrade for free anyway so there’s really not that much difference. I spent a day or two thinking about what to do. I have had a Palm Treo 600 for several years. I think I must have mentioned before that it is not a perfect telephone but it does allow me to take a whole pile of numbers and information with me when I am on the road; and that is very useful indeed. So I decided to upgrade to the Treo 650. And that is where the problems started. The Orange shop I was in said that they have been unable to source a Treo for months and the other central London outlets that I contacted said the same. Other networks now offer the Treo so I contemplated switching – which is a big deal for me because I have an irrational loyalty to Orange despite recent poor service and packages I am not convinced are great value. Fortunately, there were some very helpful people in the Orange store in Wimbledon. In fact, I can’t recommend that shop too highly and that is the point of this post. While other shops were unhelpful, Wimbledon were fantastic. It might have helped that they actually had the phone I wanted in stock but I think it deserves notice that they were more than helpful. So, on Wednesday I walked out with a shiny new Treo 650. Let’s see what it’s like.